Magnetic reconnection is an efficient mechanism to transfer the energy stored in the magnetic field to the kinetic energy of particles in the plasma. Scientists know that, in some circumstances, this phenomenon can accelerate electrons to very high energies. Using data from ESA's Cluster mission, scientists have discovered that the acceleration is a result of magnetic reconnection proceeding at an unsteady rate. In this study, the scientists used data taken as the Cluster spacecraft were in the trajectory of the jet directed to Earth, so they could directly sample the plasma particles in situ and probe the properties of the jet. They noticed an interesting structure in this jet as it travelled towards Earth: firstly, it was not a single jet but two distinct ones, launched with a time difference of about 25 seconds. 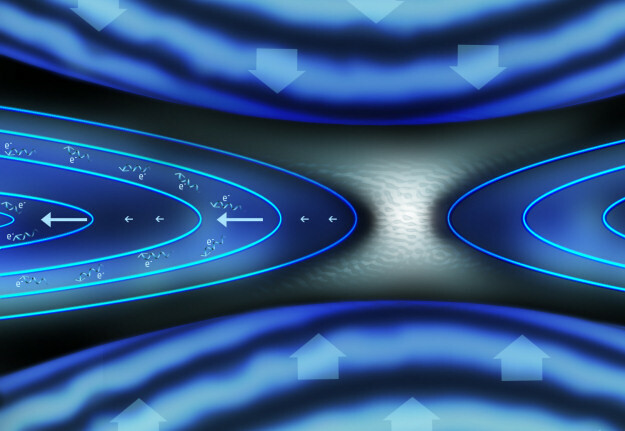 Secondly, as indicated in the illustration, each of the two Earthward jets showed a finer structure, with the bulk velocity of plasma increasing in the leading part of the jet (indicated by the long arrows) and decreasing in the following part (indicated by the small arrows). In the part of the jet where velocity is rising, the magnetic field is compressed by the high-speed flow, and the magnetic field lines get close to one another. This boosts the magnetic field and 'traps' the particles, forcing them to interact repeatedly with the magnetic field: eventually, this accelerates electrons up to 100 keV, and even more. In the illustration, accelerated electrons are represented as spiralling lines in the leading part of each of the two jets. The fine structure of the jets, which causes the acceleration, is thought to arise because the magnetic reconnection occurs at an unsteady rate. In turn, unsteady reconnection can be caused by temporal variability in the speed of the inflowing plasma that triggers the process, or by turbulence that develops directly in the magnetic reconnection site.